The Brushed Steel Breakfast Bar Stool Black is a definitive design that speaks volumes of contemporary panache. Showcasing a sense of subdued sophistication, this is a modern piece that delivers cool class and charisma to your kitchen worktop or bar. The perfect kitchen accessory, the elegantly padded seat boasts a superbly supportive backrest, ensuring maximum comfort even for long periods of use. Enhancing its style is the horizontal stitching on the front and back of the seat, lending a smart and sophisticated aesthetic. Covered in black faux leather that is soft to the touch, it works in perfect harmony with the frame. The brushed steel finish of the frame has a modern muted look. 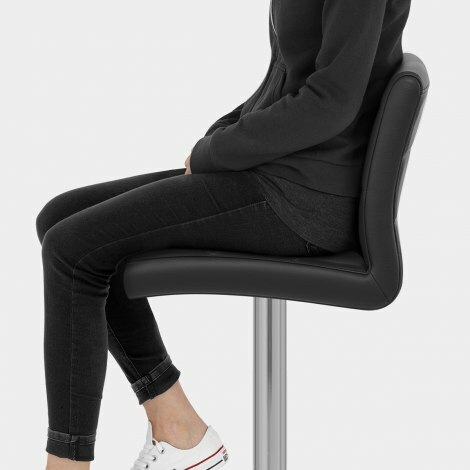 Variable height and 360 degree swivel are achieved through the gas lift mechanism, whilst and a trendy triangular footrest making a practical perch for the feet. Completing the Breakfast is a rubber base, helping to keep your floors in pristine condition. "Look lovely without being bulky"
After searching for and looking at numerous breakfast stools i came upon these. Took a gamble because they were on line, glad i did, they look good in my new kitchen and they are very comfortable. Easy to put together too. Excellent service and very good quality stools . Very happy customer. Very pleased with these stools , look lovely without being bulky , delivered within 2 days from ordering . Will definitely use this company again and highly recommend. Chairs were delivered within 24 hours of placing the order. Easy to assembly, lovely quality. Purchased two grey stools for my new kitchen. Was worried that I hadn’t seen them before but I didn’t need to worry. 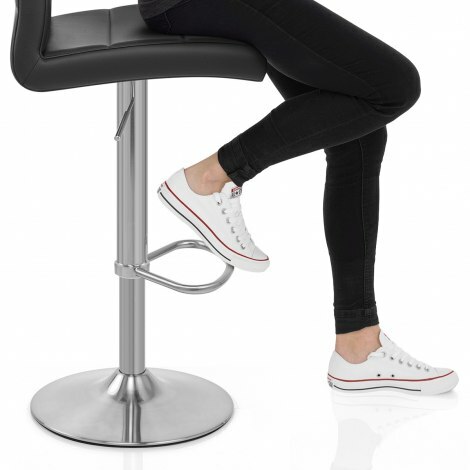 The stools are really good quality, comfortable and of a good weight so you don’t feel like they are going to topple over. Would thoroughly recommend.